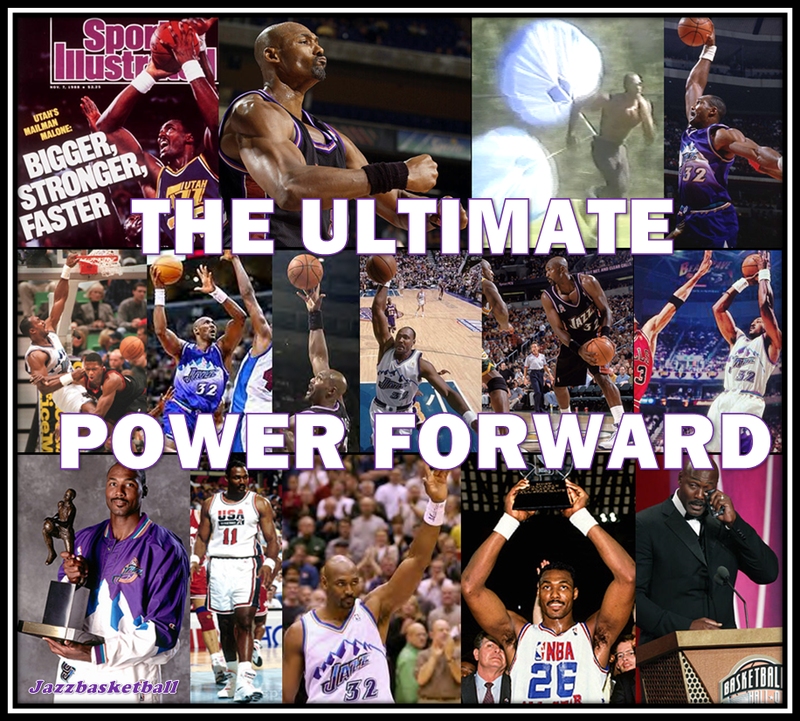 This is Part 4 of “The Ultimate Power Forward” series, detailing several of the key components that made Karl Malone the greatest power forward to ever play the game. After changing ends of the court to breakdown Karl Malone’s outstanding defense, let’s examine how the Mailman changed ends of the court by running the floor harder, faster and more consistently than any big man in the history of the NBA. Most bigs will run hard only when they begin a possession with a positional advantage against their opponents’ transition defense. Karl Malone ran hard regardless of his starting point – and as a result ran himself to easy baskets simply by blowing past multiple defenders (and teammates) on his 94-foot sprint to the rim. 1. Here, Malone is further away from Utah’s basket than all 9 other players on the court when Utah gains possession. 2. Nevertheless, Malone gets a step on Scott Pollard and then blows past Chris Webber and two other Kings en route to a layup and 3-point play opportunity as Pollard arrives just in time to foul Malone but not prevent the basket. Karl Malone not only ran hard, but he ran wide – which is becoming a lost art in today’s game. The Jazz’s inability to covert 2-on-1 and 3-on-1 fastbreaks was maddening at times last season, and while most fans automatically blame the ball-handler for the failures, the players filling the lanes are often just as much at fault if not more so. Similar to running an option or bubble-screen to both the boundary side and field sides in college football (wider hashes compared to the pro game), running lanes wide in basketball stretches the defense laterally by forcing them to cover all the entire width of the field. Not only does it create better passing lanes, it can also creates room for the point guard to attack 1-on-1 in transition when the defense expands outward. 1. Here, Utah takes possession with Malone in the center of the court. Rather than take the easy route and plod directly down the middle (the shortest path between two points is a straight line, right?) Malone re-directs toward the sideline. 2. Malone runs the boundary, creating as much separation from the ball (which should ideally always stay in the middle of the floor on a break) as possible. 3. This forces the lone defender back (Avery Johnson – circled) to guard virtually 40-feet with two Jazz players filling the lanes wide. Stockton hits Malone on the wing for an easy layup. One more example of “running wide” to help the passer and put extreme pressure on the defense. 1. Utah gets the rebound and rather than running a direct path to the Jazz basket, Malone veers out wide (about an extra 15-20 feet) to run parallel to the sideline. 2. This puts the lone defender back (Damon Stoudamire – circled) in a virtually impossible 2-on-1 situation, with a 25-30 foot lateral gap between the ball and Malone. 3. Because of Utah’s excellent floor-spacing on the break, Stoudamire is unable to play both the ball and the pass and Stockton has a clear passing window to hit Malone for the layup. With Karl Malone back tutoring Utah’s bigs on a part-time basis, I look forward to seeing how Utah’s big guys fill the lane in the upcoming season – especially since it appears to be a point of emphasis that Karl made clear in his radio interview the day he and Greg Miller announced the Mailman’s new role. As the late Larry H. Miller often pointed out, Karl Malone not only ran hard to get easy baskets, he ran hard to set the tempo and punish his opponent. Karl Malone was the best running big man in NBA history because he was not only relentless – but consistently faster, in better condition, and more aware of how to fill open lanes than his opponents. A lot of that is because Malone was a phenomenal athlete, but some of that can be learned and it would be awesome if a Derrick Favors or Enes Kanter can develop a similar understanding and mentality to punish their opponent not only with physicality, but with speed and cardiovascular endurance.